Sedge meadows; moist or dry but not wet grassy fields, hay fields, and pastures; roadsides. 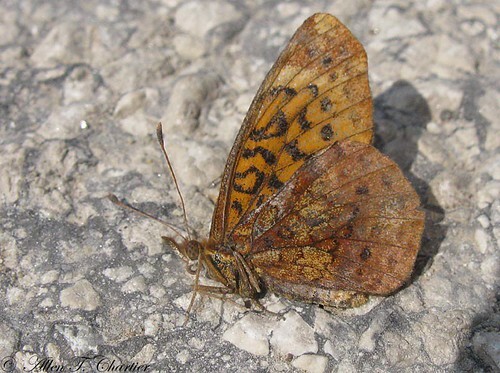 This is the most common and the most widespread of the lesser fritillaries (genus Boloria). It is a medium-sized brush-foot butterfly, 1⅜″ to 2″ in length with a wingspan of 1¼″ to 2″. The forewing is squared off below the tip, unlike all other fritillaries which have rounded wing tips. The upper sides of both wings are light orange or yellowish-orange with black dots, chain markings, and jagged lines. The eastern subspecies (B. b. bellona), the only subspecies found in Minnesota, is slightly darker brownish-orange toward the base. The western subspecies (B. b. jenastai and B. b. toddi) are darker orangish-brown toward the base and darker overall. There is a postmedial band of round spots, a submarginal band of flattened spots, and a marginal band of small spots. The submarginal spots are distinctly separated, are not chevron-shaped, and do not point inward. The marginal spots are roughly oval, rectangular, or semicircular, and may point outward. There is usually no black marginal line. The underside of the forewing is orange in the basal and medial areas, lighter yellowish-orange in the postmedial area. Black markings mirror the markings on the upper side. The subapical area is mottled orange and brown with a pale purple rectangular spot. The underside of the hindwing is orange near the base and has a pale purplish sheen on the outer half. The purplish sheen may not be apparent on older individuals. There is occasionally a pale purplish spot on the leading edge near the base. Unlike most lesser fritillaries, there are no white or silver spots on the wing undersides. The caterpillar is less than 1″ long. In the early stage it is green and shiny. Mature caterpillars are gray and black. Each abdominal segment has 5 branched, yellowish-brown, spike-like projections (scoli), one on the upper (dorsal) surface, and on each side one in the subdorsal area and one in the spiracular area. Mature caterpillars are found from April to September. Nectar of flowers, mostly those in the Asteraceae family, and especially those with yellow flowers. The female lays pale greenish-yellow eggs on twigs or leaves of a plant near, but not on, a host violet. The eggs hatch after about 11 days and the larvae search for and begin feeding on a nearby violet. Third or fourth instar caterpillars overwinter. Males emerge before females. Males patrol low over grassy areas with a slow, zigzagging flight during the day. Sources: 7, 20, 21, 22, 29, 30, 71. The range of meadow fritillary has expanded over the last 500 years as land was cleared for for timber and for pastures and hay meadows. Today, the range continues to expand southward from the southeastern states even as it contracts in the northeast. A spiny, branched projection from a larval body wall, the branches terminating with a single stiff, hair-like or bristle-like tip. Plural: scoli. Common milkweed patch attracting Meadow Frittilary (Boloria bellona), Skippers or Duskywings, honey and other varieties of bees, flies and some unique wasps. Video recorded by Dan Haynes. A gorgeous Eastern Meadow Fritillery Butterfly feeding on Gallardia flower. At the end you can see its tongue sucking up nectar.